As we were just mentioning yesterday morning, we’ve been tracking the INSY 01/19 $8 and $9 Calls since Wednesday morning. After Friday’s session brought us some solid gains, we mentioned that we could be in line to see an extension to those moves, and that we’d look to roll up our strike price to the $10-level if the stock held above its premarket low of 9.75, which it did with no problem. We were able to see some nice extensions to the highs we had already observed in the $8 and $9 Calls, and as a nice move on the $10′s as well. We’ve now witnessed the $8 Calls run from .90-3.20, for a gain of 255%, while the $9′s have gone up from .60 to 2.70, which works out to a 350% run. Excellent gains were there for the taking on the $10 Calls as well, as they ran from .70-1.80 on the day, a 157% rip. A play on the stock alone from the low on Wednesday following our initial alert at 7.64, to yesterday’s high of 11.62, would have been good for gains of up to 52%and the stock has trended even higher in the premarket this morning, so we’ll be on the lookout for this party to possibly keep rolling. We’d also like to swing back around to provide updates for a couple of our favorite cannabis plays. Back on November 7th, we reminded our readers of what a big year 2018 was gearing up to be for the marijuana business. We included a list of cannabis plays to watch closely, and among them was ACBFF and TRTC. Two stocks that we’ve been tracking for years. There;s not going to be any slowdown in our tenacity to cover cannabis stocks as we progress into the new year. California kicked off legal recreational sales this week, and Canada will do so in just six short months. 2018 is set to be a very green year! We have literally never stopped pounding the table on our interest in marijuana related stocks for more than five years now. While we cover something in the space practically every day, occasionally we sense a greater trend coming for the sector as a whole and issue reminders to our readers accordingly. The last such post, we published on November 9th, reminding our audience that we expected a resurgence heading into 2018, which figures to be a huge year for cannabis based business in general. We gave a list of a handful of the symbols we routinely track which included MJNA, TRTC, MJTK, AGTK, GRNH, HEMP, ACBFF, APHQF, TWMJF, and CBIS. GRNH and CBIS are have always been two of our favorites, although as we said, the sector as a whole will continue to be a major point of focus for us going forward. GRNH. since November 7th, has trended up from a low of .0341 to a high of .072; an increase of 111% Meanwhile, CBIS, in the same span has run from .0311 to .11, for a big 254% rise. These are just to name a few. Our docket of cannabis plays that we follow regularly is far too large to update all in one report, but once again, we’re going to be placing a high amount of focus on everything pot related heading into and throughout 2018. 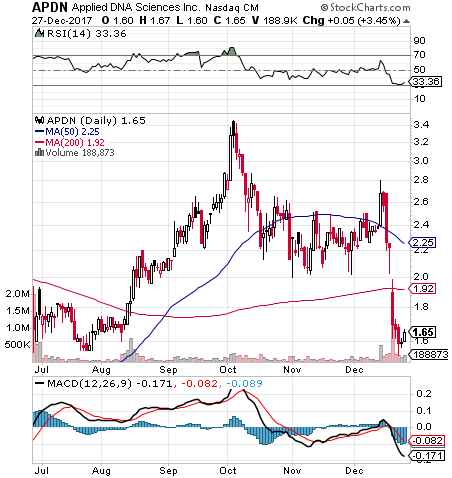 We also would like to highlight APDN, a stock that has an interesting bottom setup on the chart. As you can see on the included snapshot, the PPS has been beaten back to its lowest levels since this summer, and are hovering around a solid support level. Couple that with the company being slated for a post-market earnings report, and we’ll be interested in tracking the activity in APDN at least through the remainder of this short week, and possibly into the upcoming short week as well. 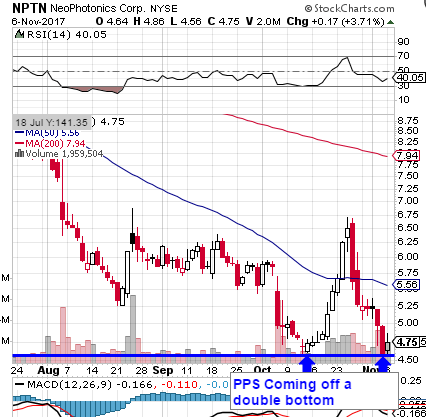 We’re always bargain hunting for stocks that have been recently beaten back to what appear to be unsustainably low levels, and we’re observing one heck of a double bottom setup on NPTN at the present time. Twice now the stock has touched and rebounded off of the mid-$4 range, with the annual low coming in at 4.56. We’re going to want to place NPTN on watch in sessions to come and look for the stock to establish higher levels of support. It’s been awhile since we had a look at VRX, and as it turns out, this is another stock that looks ready to start a trend off of a recent relative low. VRX is gapping up considerably into the $14-range this morning on the heels of a solid earnings beat. We’re going to signal a range of options contracts to watch for some possible dip-and-rip activity. This is just the type of setup we routinely look for, and we’ll be tracking the VRX Weekly $13-14 Calls for the remainder of the week. It has been a slow year in general for many domestic cannabis stocks, due, at least in part, to a DOJ led by outspoken marijuana opponent Jeff Sessions. It has created an environment of uncertainty pertaining to the federal government’s likelihood of creating problems for marijuana businesses, even in states where voters have officially spoken and legalized the plant. The marijuana movement is here to stay, but at present, is dealing with this roadblock of sorts. That doesn’t mean our interest in the sector has diminished. In fact, we’re as exuberant about the future of the cannabis industry as we ever were. North of the Border, Canadians will enact a nationwide end to prohibition just 8 months from now. The World Anti-Doping Agency, which was formed by the International Olympic Committee to police the use of performance enhancing drugs in athletics, also recently removed Cannabidiol (CBD) from its list of banned substances, opening up a huge market for the hemp-derived product. Here are just a few of the cannabis plays that we track on a regular basis, and will continue to do so as we head into 2018, which we feel is going to be a big year for the industry and all of its subsectors. Maybe the biggest one yet! We got head-faked a little bit in terms of the cannabis sector in the past year or so. Leading up to last fall, anything even remotely tied to marijuana was going through the roof, with seemingly no end in sight. Then a regime change in Washington led to the appointment of self-avowed cannabis hater Jeff Sessions to the head of the DOJ. That led to a considerable cooling of what was previously the hottest market sector. That being said, it has been business as usual for companies operating in the space in places that have taken the step of ending prohibition. Growth is happening all around, and the investment community has taken notice. The cannabis sector is showing signs of heating up once again, so we want to return to some of the plays we’ve covered in the past and highlight a few that could stand to see some good moves in the days and weeks ahead. Dewmar International, Inc. DEWM – We just signaled our interest in DEWM in Friday morning’s premarket report, and the stock made a solid two-session swing. From Friday’s low of .0108 to .0163 yesterday, marking a move of 51% We’ll want to continue to track its movements,particularly after this morning’s news. DEWM announced today that it filed a provisional patent with the US Patent and Trademark Office for the treatment of lung cancer with cannabinoids, so that’s going to be another interesting storyline to follow with respect to DEWM. Also going on our refreshed cannabis watchlist of previously tracked stocks will be PNTV, POTN, MCIG, MCOA, and TRTC. We’re always looking for a good post-earnings options play and we may have one with NFLX this morning. Up 10% in premarket trading on a solid beat, we’re going to be looking for a potential dip-and-rip scenario that could lead to some hefty intraday moves. Our targets are going to be the NFLX Weekly $172.50-180 Calls. The move came on more than nine times the 30-day average volume, and the stock held a penny into the close, maintaining well over half of its daily advance, so we’ll be very interested to see how that head of steam transfers to this new trading week after a three-day weekend. *We encourage all of our readers to join in on our daily in-session live chats. To participate, simply create/sign into your Skype account and send a contact request to ‘stocksumo’. We’re heading into 4/20 week, with the holiday coming up on Thursday. For the uninitiated, 4/20 (“Four-Twenty”) has been a marijuana counter-culture holiday for decades, and in recent years as the legal cannabis space has really taken off, it has been taken to a new level through viral marketing events, festivals, celebrations, and targeted ad campaigns. We would expect the frequency of press releases (and with them, increased visibility) from companies operating in or around the space to rise over the course of this week. We would also expect subsequent heightened activity in many cannabis stocks. In accordance with these expectations, we’ll put the many cannabis stocks we track on a routine basis on even closer watch. Stocks like CBIS, OWCP, RMHB, SGDH, TRTC, and more, will be high on our watchlist this week.